Direct train service between Agartala and Kolkata will be launched before the Durga puja, a top official of the NF Railway said today. "A direct train service between Agartala and Kolkata would be started anytime before the Durga puja," Chief Engineer of NF Railway, Harpal Singh told reporters. Tripura entered the broad gauge railway map of the country on July 31 with Railway Minister Suresh Prabhu flagging off the Agartala-New Delhi 'Tripura Sundari Express'. He also laid the foundation stone for the 15-km-long railway track to link Agartala to Akhaura in Bangladesh, jointly with his Bangladeshi counterpart Md Mujibul Haque. 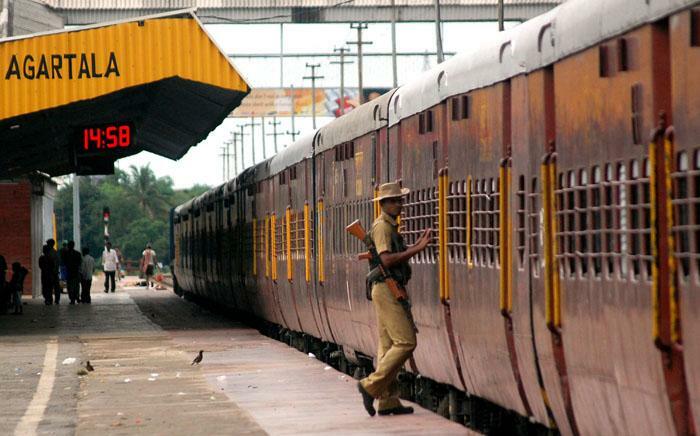 Prabhu said a regular train service between Agartala and Kolkata would also be started. Singh said, the work for the Agartala-Akhaura rail project would be started this year and Rs 100 crore was already handed over to the Tripura government for acquiring land for laying the tracks. Meanwhile, the Railway Safety Commissioner of the Indian Railway, Sailesh Kumar Pathak inspected the 45-km-long Agartala-Udaipur rail track and announced that it was ready for rail connectivity. The Udaipur railway station was built on a lake and the Carbon Wrap method was applied for construction of the station. "The Carbon-Wrap method was applied first in construction of the Santa Cruz airport of Mumbai and for the second time in the construction of Udaipur station," Pathak said.